Issue 7A of the MARVEL COMICS INDEX, published June 1978, was devoted to indexing THE INCREDIBLE HULK (series one 1 - 6 and series two issues 102 - 227). 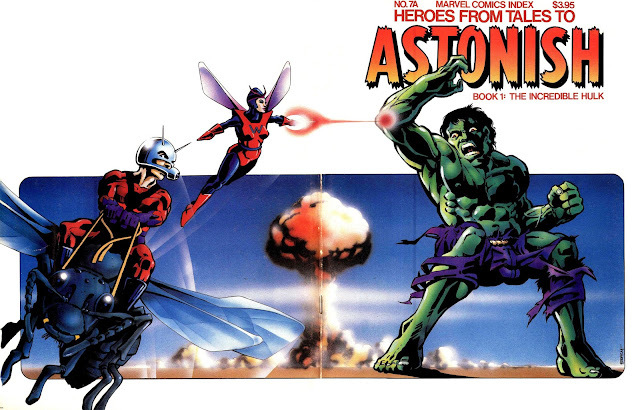 Between those two bookings, the Green Goliath shared the pages of TALES TO ASTONISH with Ant Man/ Giant Man and the Wasp. When the Hulk took total control, from April 1968, the existing TtA numbering was retained. The wraparound cover art is by Ken Steacy.